Home → Women's Issues → Motherhood → Inducing Labor for Convenience? Just Say No. The idea of inducing labor has terrorized me since the birth of my son. It’s synonymous with what I still consider my biggest failure—not allowing Noah to be born on his terms, instead trying to schedule him into my life. I wish I could return to the weeks leading up to Noah’s birth. I’d do more research on inducing labor ahead of my due date, and I’d say “No, thanks” to my doctor’s suggestion to induce for the sake of getting it done. My OB-GYN had suggested it, and I trusted her. She was warm, laid-back and I believe she had my best interests in mind, not those of the big pharmaceutical companies. I still believe that. I was terrified of childbirth. Inducing sounded like a safe way to introduce order to chaos. In seeking a tidy ending to my uneventful pregnancy, I was trying to stay in control of my body and the baby. It seems I wasn’t alone in my quest for convenience. “No one goes into spontaneous labor anymore,” an obstetric anesthesiologist at one of Boston’s largest and most respected hospitals, told me this week on background (which means he did not want to be quoted on the record). “We induce them. They like it that way. It’s more convenient,” writes author Jennifer Margulis on the Facebook page for her book, The Business of Baby: What Doctors Don’t Tell You, What Corporations Try to Sell You and How to Put Your Pregnancy, Childbirth and Baby Before Their Bottom Line. Matt and me early on the morning of March 2, 2009. 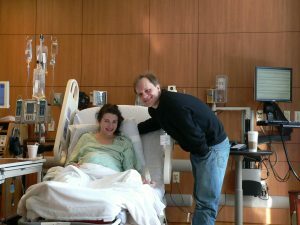 We induced labor at 8 a.m., and Noah was born 12 hours later, at 8:10 p.m.–a rather short time for an induction, or so the nurses said. Photo courtesy of Matthew Cowan. Inducing labor can be a lifesaver, the article points out, if it’s riskier for baby to stay inside mom than to be born, based on guidelines from the American College of Obstetricians and Gynecologists. I wish I’d read the MNT story before Noah was born. Shame on me. I’m used to doing extensive research as a reporter. I have no excuse for slacking, particularly regarding the life of my unborn child and my own well-being. I believe that induction ought to be reserved for high-risk situations or emergencies. Childbirth is not convenient, nor is motherhood. I suspect the message of “Just induce—it’s so convenient” succeeds in America because we’re bred and badgered to believe that we can have it our way, no matter what “it” is. The birth of my second child was natural, spontaneous, and one of the best events in my life. I refused Pitocin. I pressed on for as long as possible without painkillers, and opted for conservative doses. I knew better, so I did better. That same principle applies to the lessons I’m learning today, with a 4-year-old and a 21-month-old. Noah is teaching me, and I’m doing better by him, and by Syma. Parents may strive to raise their children right. But children raise their parents, too—to new levels of awareness, love and humility. Kristina, I appreciate the thoughtful way in which you addressed this subject. I was a high-risk pregnancy, induced 6 days before my due date and have always thought the idea of “controlled labor” an oxymoron, at best. Thankfully, I had no complications, but I know others who have. Your observations are insightful and appreciated. Thank you! Thank you for writing this article. I really needed to read this. I am pregnant with my first. Today I went to the doctor, and he asked if I wanted to be induced next Wednesday at 39 weeks.I told him I would think about it, but he saved me a spot just in case. No medical reason necessary. He just said “for planning purposes.” My next dr. appointment is tuesday, the day before, and I think I’m going to decline getting the induction! Thanks for writing. I’m glad you found my article, and that it helped you as you approached the birth of your child. I pray all went well with the arrival of your little one. Let me know how you’re doing, if you have a chance. You can email me directly at [email protected], if you’d like.